Over the course of the past year, I’ve written a lot about the Halifax, Nova Scotia-born and based singer/sgonwriter, electronic music producer, electronic music artist, indie rock musician and JOVM mainstay Rich Aucoin. And as you may recall, Aucoin spent time as a guest musician in his older brother Paul’s band Hylozoists before developing a reputation as a solo artist in his own right with the release of his debut EP, 2007’s Personal Publication, a concept effort written as an alternative soundtrack to How the Grinch Stole Christmas. Personal Publication EP was also the first of an ongoing series of collaborations with charitable foundations, as he supported the EP with a cross Canada tour made entirely by bicycle to raise money for Childhood Cancer Canada. After completing his first solo tour, he went on to join his brother’s band while they were on tour; however, Aucoin suffered a debilitating iron deficiency that cut his time on the tour short. But once he recuperated, Aucoin went on the road again, running partial marathons between tour stops to raise money for the Canadian Cancer Society. 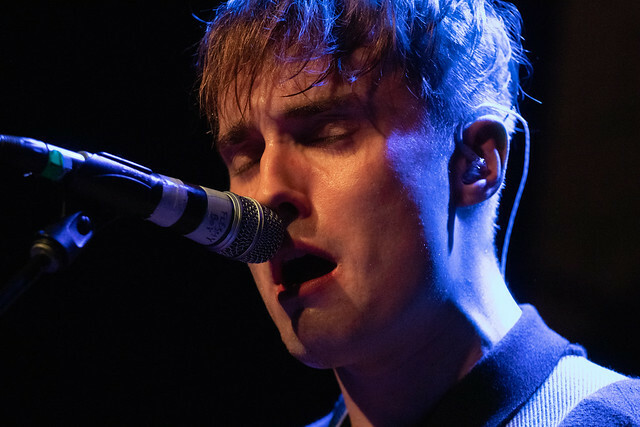 During both of those early tours, the Halifax-born and-based singer/songwriter, electronic music artist, electronic music producer and indie rock musician spent time writing the material that would eventually comprise his full-length debut, 2011’s We’re All Dying to Live, an effort that featured over 500 guest musicians, including Sloan‘s Jay Ferguson, You Say Party‘s Becky Ninkovic, The Meligrove Band‘s Michael Small and Rae Spoon. Adding to a rapidly growing profile. the album was long-listed as a nominee for a Polaris Music Prize — and the video for “Brian Wilson is A.L.I.V.E.” won a Prism Prize in 2013. Building upon a growing profile, the Nova Scotian producer and electronic music artist released his critically applauded sophomore effort, 2014’s Ephemeral. Several years passed before the release of last year’s Hold EP, and with singles like the sprawling and propulsive “Release”, the swooning M83-like “The Middle,” the jangling guitar pop meets synth pop “The Fear.” and the slow-burning and wistful “The Dream,” the EP further cemented Aucoin’s reputation for crafting slickly produced, infectious and thoughtful pop. Slated for a May 17, 2019 release through Haven Sounds, Aucoin’s third full-length album Release was co-produced by the Halifax-born and-based singer/songwriter, multi-instrumentalist, electronic music producer, electronic music artist and indie rock musician and drummer Joel Waddell. Inspired by the work of David Bowie, Holly Herndon, Fatboy Slim, Bjork, John Lennon, Future Islands, Caribou and Chic among others, the album finds the JOVM mainstay further cementing his growing reputation for his own unique blend of organic and electronic instrumentation — while thematically, the album finds Aucoin grappling with mortality, by using Alice in Wonderland as a metaphor for life’s journey. Directed by Meghan Tansey Whitton, the recently released video follows a mysterious and otherworldly figure covered in a metallic blanket, striding on a beach at sunset and as the video progresses, the figure is subjected to the elements, facing them with a preternaturally zen-like calm. With the release of 2016’s mini-album Into Dimensions, the Copenhagen, Denmark-based duo IRAH, comprised of Stone Grøn (vocals) and Adi Zukanović (keys) quickly received attention across the blogosphere for a unique take on atmospheric pop that’s ethereal yet earthy. Directed and produced by Sylvain Rusques and Simon Moreaux, the animated, lyric video further emphasizes the lysergic nature of the song, as it features a woman sensually gyrating to the song. With the release of his first two albums, Innerspeaker and Lonerism, the Perth, Australia-born and-based singer/songwriter, multi-instrumentalist and producer Kevin Parker quickly received national and international attention for his psych pop solo recording project Tame Impala. 2015’s Currents though, was a commercial and critical breakthrough: the Grammy-nominated, RIAA Gold-Certified album reflected a decided change in songwriting that resulted in some of his most emotionally direct lyrics paired with a more nuanced, textured sound that drew from psych rock, psych pop, synth pop, prog rock and R&B. “Patience” is the first bit of new, solo material from Parker in a few years, and the mid-tempo track is a seamless synthesis of classic 90s house music and 70s funk, soul and disco that features shimmering and arpeggiated synths, piano jabs, a motorik groove, congo-led percussion and a soaring and rousingly anthemic hook paired with Parker’s imitable, falsetto croon. And while being a decidedly upbeat banger, the song is centered by a thoughtful meditation on the cycles and phases of life, in which the song’s narrator makes peace with the fact that everything and everyone is transient. Parker will be making his Saturday Night Live debut tonight, which he’ll follow up with some extensive touring across the international festival circuit that will include stops at Coachella Festival, Shaky Knees Festival, Corona Capital Festival, Boston Calling, Primavera Sound Festival, Glastonbury Festival, Lollapalooza with more dates to come. Check out the tour dates below. Comprised of founding members Sebastian “Seba” Schuster, Zoe Modiga and Ndumiso Manana with their newest member, Philip “Pheel” Scheibel, the members of indie electro pop/neo-soul act Seba Kaapstad are split between Cape Town, South Africa and Stuttgart, Germany — and interestingly, the act can trace its origins to when Schuster landed in Cape Town, South Africa in 2013. While studying at the University of Cape Town, Schuster began working with Modiga and Manana in an informal setting, in which they jammed standards and rearranged songs of their choice. As they continued to work together, the more it seemed as though the trio were experience a much deeper chemistry within their work and music. Before Schuster returned to Germany, he asked Modiga and Manana if they’d be interested in recording in his home country — and over the next few months, Schuster spent his time writing and organizing sessions, focusing on what would eventually become Seba Kaapstad. After a series of phone calls, emails and trips down to Cape Town, the members of the project had written the material that would eventually comprised their debut, 2016’s Tagore. Slated for a May 15, 2019 release through Mello Music Group, Seba Kaapstad’s highly anticipated sophomore full-length album Thina finds the act adding a new member, Philip “Pheel” Scheibel while further expanding on a genre-mashing, globalist sound that draws from neo-soul, hip-hop, jazz, electro pop and Afro pop that’s intended to demonstrate humanity’s shared commonalities. Interestingly, the album’s latest single, “Africa,” a is track centered around a slick yet mind-melting production that features elements of moody jazz, thumping and swaggering hip hop and sultry soul and Pan African vibes that at points recalls Soul II Soul, Erykah Badu, theeSatisfaction, The Roots and Flying Lotus simultaneously — but with a futuristic leaning. Shot in a smoky purples and reds, in a mirrored room, the recently released video for “Africa” evokes the moody atmospherics of the song, while being equally futuristic. Comprised of founding members Andy Peña (vocals) and Devin Garcia (bass), along with David Ramirez (keys) and Adrian Loera (drums), the McAllen, TX-based dream pop act Quiet Kids can trace their origins to the breakup of Peña’s and Garcia’s previous band Dignan. Once the dust settled, Peña and Garcia began writing new material together, before recruiting Ramirez and Loera to flesh out the band’s sound and to complete its lineup. Eventually, the band earned attention-grabbing opening slots for the likes of Angel Olsen, Mitski and Miniature Tigers. With the release of last year’s full-length debut, The Dog And The Future, the Paris-based electro pop duo Agar Agar, which is comprised of Clara Cappagli (vocals) and Armand Bultheel (keys) received national and international attention for a sound and aesthetic centered around vintage synths, unique melodies and a sense of mysticism. Since the release of their attention-grabbing debut, the French electro pop duo were invited to Colors, where they performed the slow-burning Trans Europe Express-era Kraftwerk-like “Sorry About The Carpet,” a track centered by layers of arpeggiated synths — elegantly shimmering synth chords for the melodies, bolstered by supple bass synths and a motorik groove paired with Cappagali’s effortless yet sultry vocals. Earlier this month, I wrote about the Bangladesh-born, New York-based electro pop Sajeeb Saha. Best known for his solo recording Jai Wolf, Saha’s work is inspired by a diverse and eclectic array of music, including indie rock, punk rock, hip-hop, classic music and Bollywood. Thematically, much of his work draws from his own experiences growing up as a third culture kid. Saha’s full-length debut The Cure To Loneliness is slated for an April 5, 2019 release through Mom + Pop Music, and as Saha professes in press notes, “In my heart, this album is me,” professes. From the sounds to the lyrics, it’s everything that I’ve always wanted to do.” Now, as you may recall, The Cure To Loneliness’ M83-like “Your Way,” was a collaboration with Day Wave that’s centered around jangling guitars, shimmering and arpeggiated synths, soaring hooks, thumping beats and plaintive vocals — and interestingly, the song was a bitter lament from a narrator, who’s lonely and profoundly disconnected from everything and everyone, including himself. The Cure To Loneliness’ latest single is the anthemic instrumental composition “This Song Reminds Me Of You.” Owing a major sonic debt to M83, the track is centered around layers of shimmering and arpeggiated synths, warm blasts of guitars and a motorik groove — and interestingly, as a result, the track possesses a swooning urgency.